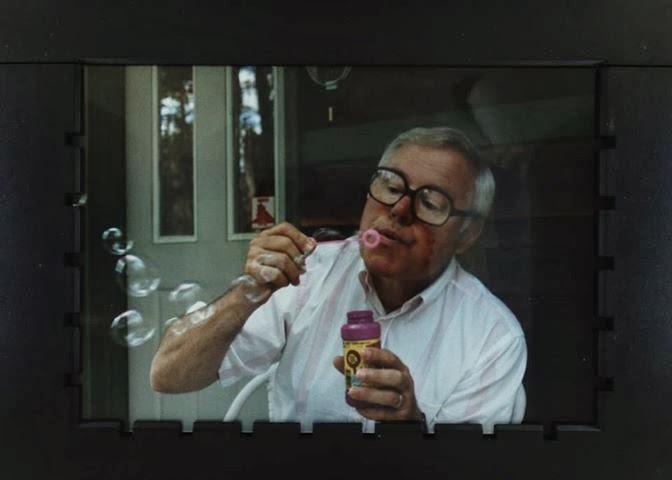 My brother posted this picture of our dad on Facebook on what would have been his 87th birthday. Dad passed away on January 1 and it still doesn’t seem quite real that he’s gone. Friends who have lost loved ones have told me the “firsts” are the hardest. The first birthday without Dad, the first Father’s Day with no dad to buy a card for, and then my recent birthday, the first one in my whole life without talking with Dad have been difficult milestones. I remember my birthday last year. Dad was living in a dementia care facility. The day seemed empty. I felt sad because I hadn’t talked with him. My husband Randy who’s always coming up with practical solutions said, “Why don’t you call him?” What a great idea! Dad was always joking. I smiled as I realized that not even dementia could rob him of his sense of humor. On his birthday in June, I decided to walk the mile or so to our small town to enjoy the flags waving from each business. Dad was born on Flag Day. Growing up, he thought the flags flew in his honor. I snapped a few pictures. Then I walked to the bakery and bought blueberry muffins for Randy and me. Dad would have approved. He loved anything baked with blueberries. My heart felt glad that I’d taken this time to remember him. Now it’s November. Glorious fall colors fade to brown. Trees are bereft of leaves. A raw chill penetrates the air. As I turned the calendar page today, a pang shot through me. It’s almost a year since I was with Dad. I know that grieving involves feeling the sadness of losing someone who was such an important part of my life. I also know that celebrating the blessing of having a wonderful father is comforting and even healing. How are you coping with the loss of a loved one?